National Organiser of the JO, MP Dullas Alahapperuma has said, in a media statement, that the then Chief Opposition Whip Joseph Michael Perera (UNP) blamed Army Commander Lt. Gen. Sarath Fonseka for attacks on journalists at that time. The release also points out that the abduction occurred just 10 days after Noyahr had made a comment on the then Army Commander. On the 17th of August 2018, the CID obtained a statement from former President Mahinda Rajapaksa about the 2008 abduction, assault and release of Keith Noyahr. In the days that followed, there was an attempt on the part of government politicians, the state media, websites connected to the government and by some NGO activists, to allege or insinuate that the former President was involved in the Keith Noyahr incident. A few weeks after that, on 12 September the CID obtained a statement from former Defense Secretary Gotabaya Rajapsksa as well, about the Noyahr incident. Thus we see that there is a surreptitious attempt to create the public perception that the Rajapaksas were responsible for this assault on a journalist. It is now ten years since this incident took place and it is important to remind the public of certain facts relating to this case. In this regard, the article titled “An army is not its commander’s private fiefdom” which appeared as the ‘Military Matters’ column written by Keith Noyahr on 11 May 2008 i.e. ten days before he was abducted and assaulted; is a vital clue as to who would have had a motive to attack Noyahr. However we see that the CID is deliberately trying to avoid taking into consideration Keith Noyahr’s article of 11 May 2008 and Chief Opposition Whip Joseph Michael Perera’s special statement in Parliament on 8 July 2008. We believe that the reason for this reluctance is because the person responsible for the abduction of Keith Noyahr is a prominent member of the yahapalana government. Instead of following the clues which may indicate who would have abducted and assaulted Noyahr, the police are engaged in a dishonest attempt to mislead the public by investigating the phone calls that are said to have been exchanged between various individuals to have Noyahr rescued. 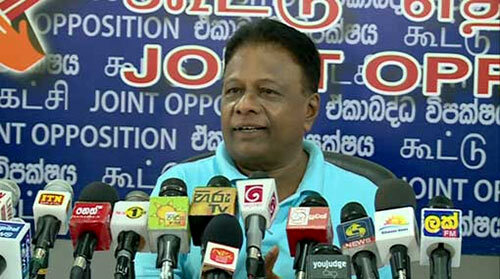 Since we cannot simply stand by and allow the CID to ignore vital clues in the purported investigation they are making, we will make a request to the police to follow up on the line inquiry that reveals itself through the article that Noyahr wrote on 11 May 2008, and the special statement that Chief Opposition Whip Joseph Michael Perera made in Parliament on 8 July 2008. If we do not receive a satisfactory response from the police to this request, we will present the relevant facts to the Courts.